Our Bernard Sunley care home in Woking has started running a bimonthly nursery club within the home, which is proving to be a fantastic success. 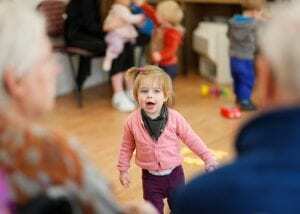 A group of up to ten children aged between one and four attend twice a month with their childminders. They spend time in the home’s coffee shop where there is a great selection of toys for the children and where residents can join them to play and chat. The children also walk around the home visiting residents in the various communal lounges. Community engagement is an important part of life at Friends of the Elderly’s care homes. We’re always on the lookout for exceptional health care assistants across our homes. We offer competitive pay, excellent benefits and the chance to work in a dedicated, caring team. Find out what vacancies are near you and be part of our team.